Cupping therapy is an alternative form of Chinese medicine where, cups made of different materials such as Bamboo, Glass and Earthenware are placed to create suction on the skin. History of cupping therapy dates back to ancient Egyptian civilisation and Egyptians used this therapy as early as 1,550 B.C. There are two types of cupping therapy such as Dry cupping which includes only suction and wet cupping, which is a combination of both suction and controlled medicinal bleeding. A flammable substance such as herbs or alcohol is placed in the cup and set on fire in both the types, when the fire goes out; cup gets placed upside down on the patient’s skin. There are many benefits of cupping therapy and the tingling sensation that is associated with cupping is often soothing and relaxing, but it all depends on the assessment of the problem by the practitioner and on the comfort level of the client. Most common area to be cupped is the back, but Chinese cupping works best on other fleshy areas of the body as well, these cups stay for a longer period of time on the skin. It might cause the skin to turn purple, red or blue, especially if there is a blockage under the area that is cupped. Discolouration of the skin could last for few weeks but are not painful; procedure is usually repeated when this condition is resolved. 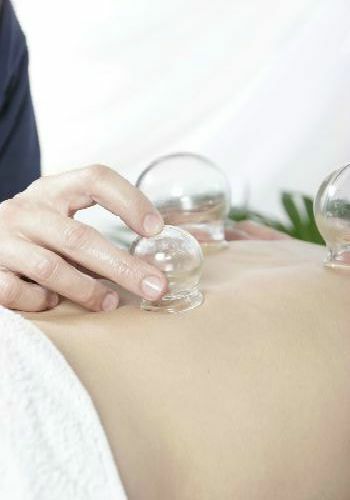 Common techniques of cupping is fixed and moving cupping. In fixed cupping, cups get placed on a selected portion of a body and are left still without moving. In moving technique, practitioner applies cream and massages oil on the skin and slides them around the body. Most common cupping therapy benefits are that, they relieve one from stress, pain, fatigue, back pain, allergies, muscle pain, anxiety, few skin conditions and frequent colds and flu. Visit us at our clinic and experience the therapeutic benefits of cupping. Doctor Hu is proficient in cupping back, ankles, hands, wrists, legs and thus heals specific organs that correlate with the meridian points under these organs.